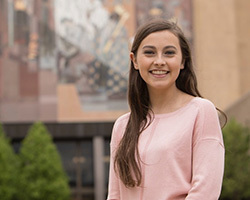 Four undergraduate students in Notre Dame's College of Arts and Letters received Undergraduate Library Research Awards (ULRA) during the 10th annual Undergraduate Scholars Conference on Friday, May 5. Two students in the First Year of Studies were also recognized. The award honors individuals who conduct original research and demonstrate exemplary skills through their broad use of library resources, collections, and services for their scholarly and creative works. Sponsored by the Hesburgh Libraries and the Flatley Center for Undergraduate Scholarly Engagement, with support from other campus entities, the ULRA provides students with a network of support and offers inspiration to those beginning original research or capstone projects. 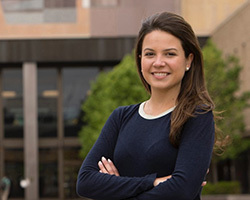 Mendoza won first prize in the senior/honors thesis category for demonstrating excellence in library research skills for her thesis, “Political Polarization in Venezuela under Hugo Chávez.” Michael Coppedge, professor of political science and faculty fellow at the Helen Kellogg Institute for International Studies, served as her adviser. 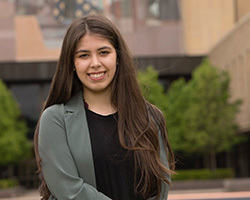 A political science major with minors in Latin American studies and Portuguese and Brazilian studies, Mendoza’s research suggests that, in many ways, the rise of Chávez in Venezuela 18 years earlier presaged the polarization sweeping electorates across the world in 2016. Honorable mention in the senior/honors thesis category was awarded to Donahue, who conducted extensive research for his thesis, “Writing of Paradise: The Marian Prayers Composed by the Franciscan Tertiary Sisters of the Pütrich Regelhaus Found in Cgm 4484 and Their Historical Context.” Donahue, a German and theology double major with minors in Medieval studies and the Glynn Family Honors Program, was advised by Claire Taylor Jones, assistant professor of German. Garcia, the first-place winner in the 20000-40000 category, is a sociology major with a minor in teaching English to speakers of other languages. To fulfill a requirement for her seminar course, Garcia wrote a paper titled “Oliver Twists or Fagins? : Child Beggars in the UK in the 17th Century and Present Day.” She was advised by Mariana Candido, associate professor of history. In her ULRA submission, Garcia described her path to becoming a more sophisticated scholar. She presented a detailed accounting of the various library resources and faculty expertise, notably Western European History Librarian Julie Tanaka, that helped her to develop her research topic, conduct diverse research methods and complete her paper on the differences in governmental attitudes toward child beggars in the United Kingdom in the 17th and 21st centuries. 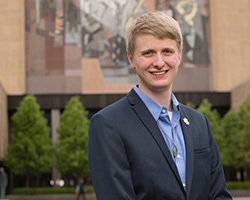 Jankowski, honorable mention recipient in the 20000-40000 category, is a sophomore double major in philosophy and Program of Liberal Studies with a minor in theology. His essay titled, “’Sehet! – Wen? – den Bräutigam!”: Matthew’s Jesus as Bridegroom in the Matthäuspassion of J.S Bach,” was advised by David Lincicum, associate professor of biblical studies/Christianity and Judaism in antiquity. Reid, a First Year of Studies student who will major in accountancy and applied and computational math and statistics, took first place in the 10000 category. 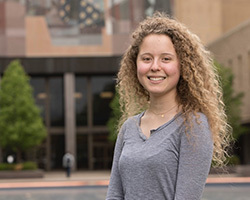 She wrote her writing and rhetoric paper titled “Hesburgh’s Relationships: The Success Story of the Tantur Ecumenical Institute ” and was advised by Arnaud Zimmern, Ph.D. student in English and instructor for writing and rhetoric. 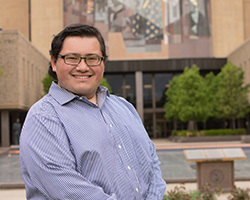 Maazouz, a First Year of Studies student who will major in chemistry and computing pre-professional studies and minor in the Hesburgh Program for Public Service, won honorable mention in the 10000 level category. She wrote “A Woman’s Manifesto: Effects of the Perceptions of Women in Society” as her final project in her writing and rhetoric class. Her adviser was Erik-John Fuhrer, Ph.D. student in English and Presidential Fellow.